We have our cleaner – greener companies coming on April 22nd to talk about how “earthy” products can save your skin as well as help our planet by not clogging it up with unwanted additives. 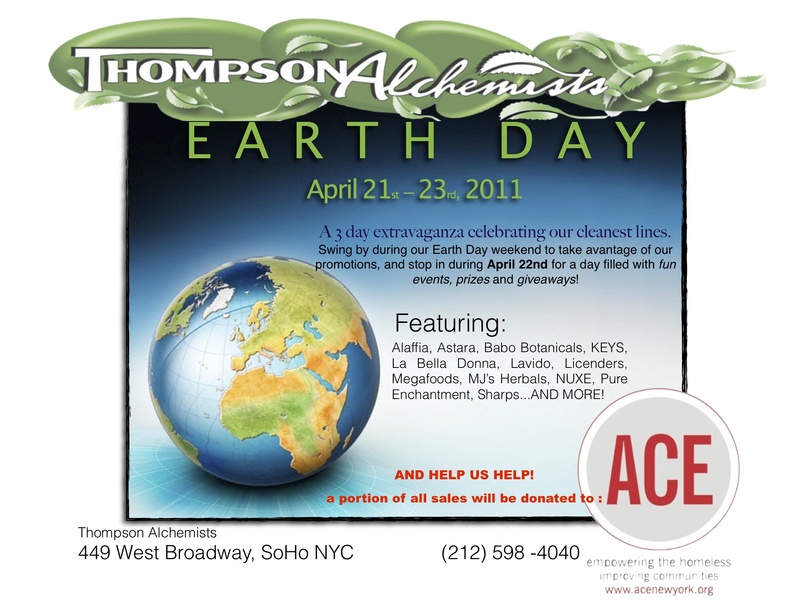 It doesn’t stop there, from April 21st to April 23rd 2011 a portion of purchases made from our Earth conscious companies will be donated to ACE. has been part of our lives ever since we opened in 1994. Thompson Chemists has always felt that the best way to help the world is help the ones around us and urge them to spread the LOVE. That’s why we fell in love with ACE, because that’s where “the buck stopped”. ACE empoweres one person at a time to benefit one building at a time, one street at a time, one neighborhood at a time and so the vibe shall flow. Why not? Why can’t we make difference in the world? After all, isn’t that our purpose? Well we think it is. So stop by between Thursday April 21st and Saturday April 23rd and help us help.